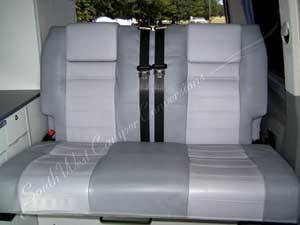 Rear seating and seat belts in motorhomes has become something of a hot subject recently. There was the change in child seat laws which came into effect in 2006 and as of last year (2007) all new vehicles have to have seat belts fitted on all seats except those seats intended solely for use when the vehicle is stationary. There is also a change next year for any vehicle of whatever age, where seat belts are fitted in the rear; you will be allowed to carry no more passengers than there are seat belts available. On top of this there are a number of other rumours about lap belts being unsafe and the need for proper back and neck support in all travelling seats. With all this to one side, whether carrying your children or friends everyone wants to make sure that their passengers are carried safely. I recently provided information to a member of the VW T4 forum to help him write an article about the dangers of seating being offered on a well known auction site. A number of these traditional style rock and roll seat / beds are made from inch by inch box section steel, and are even shown with belts attached to them! For a seat to meet the European NCAP pull testing, a 2 seater seat needs to withstand 6 tons of pull and a 3 person seat needs to withstand 10 tons. The PSV test also includes a seat belt and anchorage test as part of your MOT, and seats that do not meeting regulations or which are not properly tested not only pose a danger to your passengers but also to the driver if the seat does not keep the passengers restrained in the back of the vehicle in the event of an accident. With this said, there are manufacturers making a number of really good quality rear seats which do meet all the new regulations. Our personal favourite at South West Camper Conversions is the French manufactured RIB seat. This seat can be supplied with 3 point harness seating making a safe rear seat for your passengers, as well as being easy to fit the necessary child seats for your children. Other options available include a Thermorest overlay to make the flat bed softer, integral head rests, arm rests and a slide mechanism to slide the seat forwards and backwards (the same as most vehicles front seats). We are happy to work with any DIY builder to try and get the seat which best suits their needs, and help in getting all the right measurements and specifications when ordering. The picture above is just one from our gallery and shows a leather faced RIB seat which was self fitted along with the furniture and won this years VW Camper Jam show. Please see your gallery for more images and to see how easily it is to convert this nicely moulded seat in to a flat comfortable bed. Once your DIY campervan is completed Caravanwise can provide a competitive campervan insurance quote. It is a requirement that an engineers report is obtained for the completed vehicle.